dynamic libraries error - lpeg? What doing now? md5 library is in place and works fine from interactive console etc. please help somebody, want to continue working..
PS: Maybe I've installed lua 5.1 wrong? Can you tell me how to compile lua source correctly on osx 10.8 (with dynamic libryries etc)? Has no one experienced that error? I thought lpeg would be the issue, but now I'm thinking there went something wrong with the lua installation. But what? 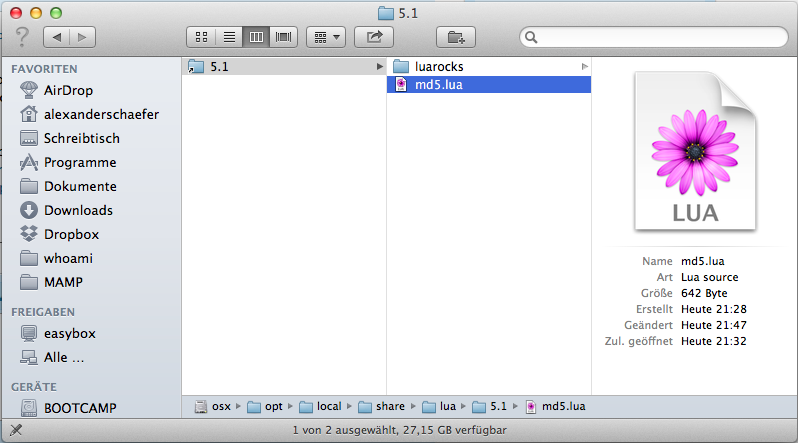 I've re-installed lua from srcatch on my OSX 10.8, now through macports (lua @5.1.4). are you referring to lpeg or md5? And you should rebuild these libraries and should't use the .dylib files coming with original Lua installation. You should build LPeg and md5 by yourself and then copy the resulting .dylib. LPeg prebuilt libraries comes with Gideros installation. You can find it at "/Applications/Gideros Studio/All Plugins/LPeg/bin/Mac OS/lpeg.dylib"
@atilim Maybe your are willing to help me along (I would adore you!). If not, it's fine, because I understand you have not endless time. Re-installed Lua again. Now from source. 1) I've installed Lua into /usr/local/ (default sub-directories). When I test my main.lua from Terminal everything works like a charm. 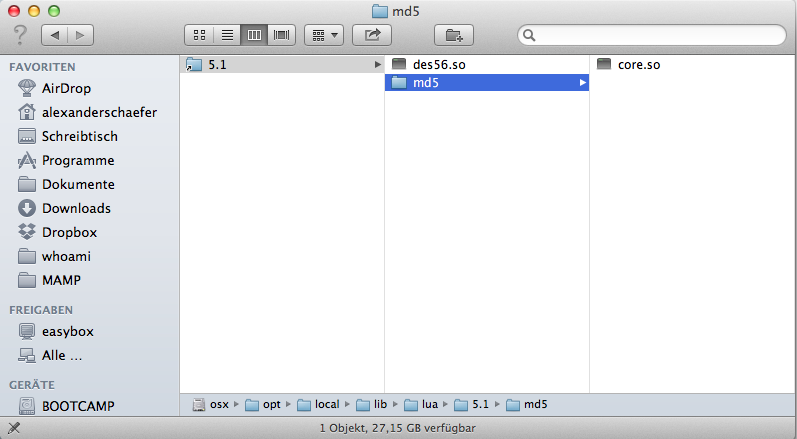 But if I run it inside Gideros or directly inside Textmate, it says there are no bundle files found. And dynamic libraries are not enabled. And such. I tried to build, but .so files are useless as far as I understand.. is this the reason it doesn't work?